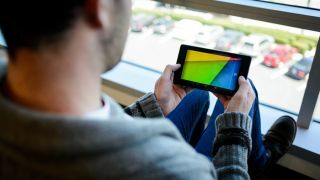 The Android 4.3-packing new Nexus 7 may be a well-reviewed machine, but it's not without its flaws. Chief among them was a glitch that caused the slate problems when trying to register multitouch commands, which is kind of a bummer for a tablet. Google, however, is beginning to remedy the particularly vexing issue. In a Google Mobile Help Forum message posted yesterday, Googler Paul Wilcox noted a fix, via a new system update, is rolling out to zap this Nexus 7 nuisance. "This update does address issues discussed in this [ Nexus 7 (2013) erratic touchscreen & keyboard] thread," he wrote. "If you're one of the people experiencing touchscreen issues, please let us know how it's going after you've received and installed the update." Last week, strings of users reported that the Nexus 7 was improperly registering touch commands, causing touch targets to randomly jump around. The leaps only seemed to arise when the tablet was using battery and not AC power. The system update currently on the way is version JSS15Q of Android 4.3, and appears to have been released specifically to fix the touchscreen problem. Users in the Groups thread reported the update is working, with one writing, "I'm thrilled to report that my touchscreen is now working within a tolerable level of perfection!" High standards, no? However, the new Nexus 7 does have one persisting problem: its disconnect-happy GPS seems to still be leaving traveling owners in the lurch. Google is, as you can guess, working on a fix. Update: Wilcox wrote in a separate post that the OTA update aimed at the multitouch issues also address the new Nexus 7's GPS problems. Thinking of a 7-inch slate but not so sure about Google-branded machines? Why not read up on the HP Slate 7?